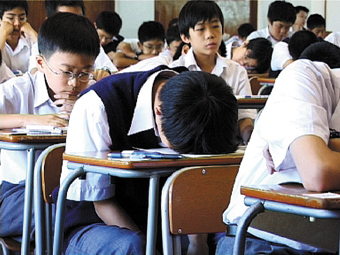 Kids asleep in class has been a scourge of school since, probably, forever, but for some reason it's really on my nerves lately. I really resent being made to feel responsible for the learning of students who sleep through my class day after day. I know--these are teenagers with no sense of their body's limits, so staying up until 3 a.m. playing Call of Duty or doing whatever it is that they do doesn't sound like a terrible idea. It doesn't kick in until 3rd period and you're supposed to be taking notes on annotation strategies. Putting your head down for a few minutes sounds so easy and lovely. I'll just rest for a minute, then, boom, the teacher is shaking you awake. "Wake up. Come on, buddy. You're missing these notes. I don't want you to miss this. You're going to be confused later if you don't get this." The teacher shakes you again. "Come on. Stay with us here." You pick your head up and scribble a few notes, then put your head back down. So tired. Stupid English class. When you finally pick it up again, the teacher, having given up on waking you up, knowing that students in a deep sleep occasionally come out of their slumbers with torrents of profanity that will be much more disruptive than letting them sleep, has moved on in the lesson. It's half an hour later. You have no idea what's going on. Well, might as well go back to sleep. Then I'll feel nice and rested for geometry. And if you're the teacher, you physically can't put a student out of your class for sleeping, because what are you going to do, pick them up and deposit them in the hallway? Calling home for a kid sleeping is pretty damn useless, too, I've found. There are some decent tips for dealing with sleeping students here, though I can't see my kiddies doing jumping jacks. I might try the "you can sleep if you're standing" trick. But until there's evidence for SleepLearning, we've got to fight the Sandman as well as every other battle in our classes. "But Someone Has to Make War"